The D2 Center Careers and Community Engagement Class offers the chance to explore career options and learn job skills, and includes hands-on Career Experience Workshops in the community. This week brings two opportunities for banking hours towards an elective credit in this course. This is perfect timing to help you prepare for the Omaha Public Library Teen Job Fair this Sat. April 7, 10 AM – 2 PM at the Mutual of Omaha Dome, 33rd & Dodge St. in Omaha. 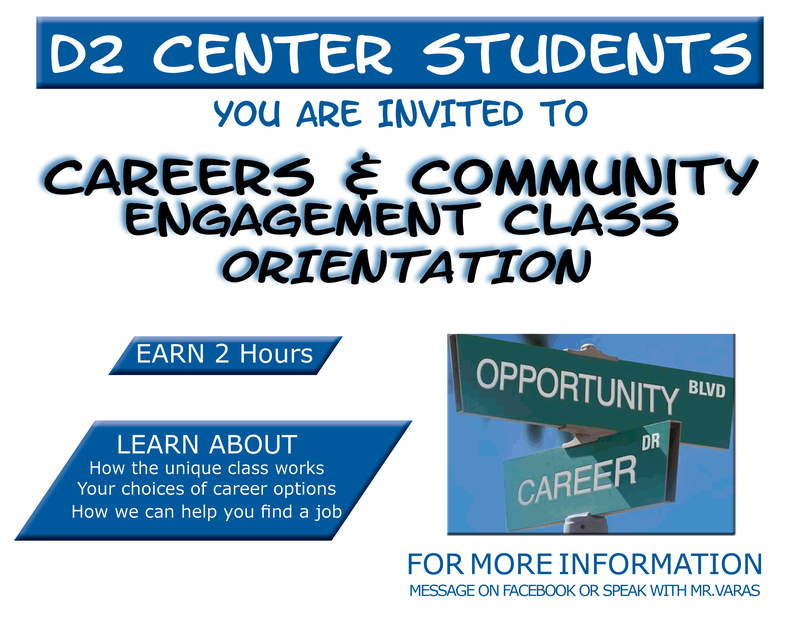 If you are a D2 Center student interested in enrolling in the Careers and Community Engagement Class, or if you are enrolled and would like to attend these events, please contact Albert Varas, a.varas @ d2center.org or 402-502-8534, or message us on Facebook. Students, please “Like” the D2 Center Students Page on Facebook to keep up with all the latest Careers and Community Engagement Class opportunities.